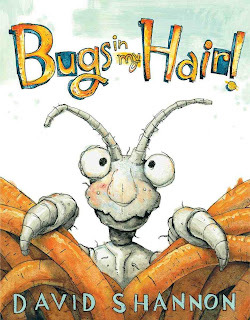 This week I read David Shannon's newest book Bugs in my Hair! to my class and they thought it was extremely funny and it made learning about germs and spreading them so much more fun. Keep reading to learn more about what we did and to find out how you can enter to win your own copy of Bugs in my Hair! Any of you who have ever had to deal with lice will laugh out loud over the words and illustrations in Shannon's new book. The story and illustrations engaged my students, generated a great discussion on the spread of germs and staying clean and healthy, and definitely made everyone laugh. The illustrations bring the story to life and make it an entertaining read-aloud for all. After reading Bugs in my Hair!I demonstrated to my students how easily we all spread germs.I sprinkled pink and blue glitter all over the palm of my hand to represent germs. Then I went around shaking the hands of my students. Then they went around shaking hands with each other. Afterward we all held up our hands to show how we had spread germs to one another. We charted ways to stop the spread of germs and head lice. Then we made germs/lice to go with our chart. Now onto the best part of this post... the giveaway! 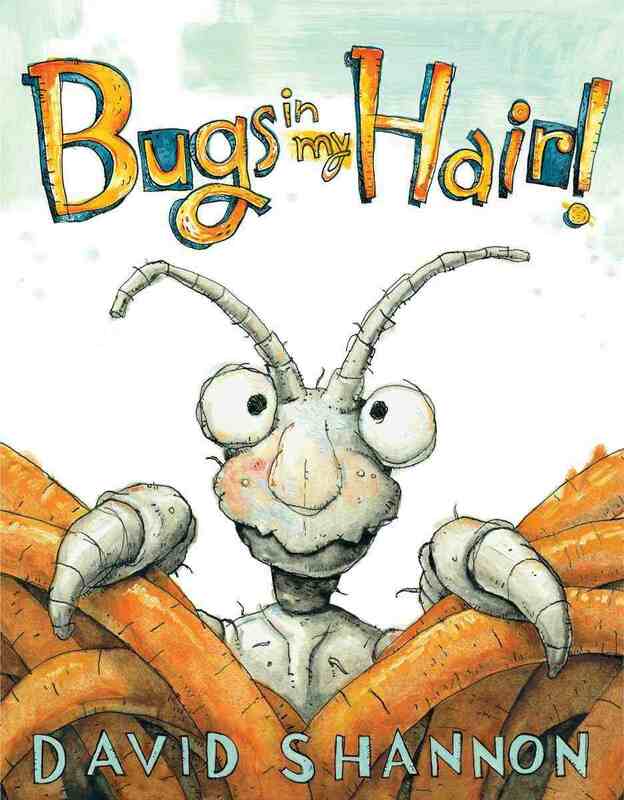 To celebrate David Shannon's new book Bugs in my Hair! Scholastic has provided a pack of three great David Shannon books to giveaway to one lucky winner. Link up with David Shannon here to find out what inspired him to write the book. This video is perfect for showing students how authors get ideas about what to write about and how we can write about anything that happens to us. Entering the giveaway is easy. All you have to do is leave a comment with your name and email. The giveaway ends Sunday, September 15th at midnight. Good luck! Read more about the book and its author below. Is something bugging you? Bestselling award-winner David Shannon shows the funny side of waging war against--oh no!--head lice. This book is guaranteed to make you laugh--and itch! From the opening picture of a happy, oversized louse appearing with his suitcases, you know these bugs are determined to stay, and Mom is about to go nuts! Nobody talks about them, but they are everywhere. (Some estimate 20 million children a year host them.) Oh the shame and humiliation of having bugs in your hair! But if you go to school, or have play dates, chances are good you might meet them someday. Maybe you already have! Lucky for you, the unwelcome bugs in this story are so funny you will be laughing aloud--even when Mom attacks them with battle-tested anti-lice weapons. Shannon peppers his hilarious scenes with fun, "nitpicking" facts about these "lousy" critters and pokes fun at common denial: "It's probably ash from that volcano in Pogo Pogo." Soon the party's over--Bye bye, Little Nasties! Once again Shannon has created a fresh, highly entertaining read-aloud classic that begs to be read again and again. David Shannon is the internationally acclaimed creator of more than thirty picture books, including NO, DAVID!, a Caldecott Honor Book and his second NEW YORK TIMES Best Illustrated Book of the Year, and three more David picture books. Shannon's bestsellers include his recent A BAD CASE OF STRIPES; ALICE THE FAIRY; DUCK ON A BIKE; and his recent JANGLES: A BIG FISH STORY. He lives in California with his family. Praise for Bugs in my Hair! Looks like a hilarious book! I would love to share this book with my first graders and a special classroom aide who handled her students visit from bus with dignity. I will never forget the look on her face when she saw a live lice crawling through his hair. My students love all his books. I love your glitter germ lesson! What a great give away! Thanks for the chance to win! Looks like a very funny book and what a creative idea to show the kids how easily germs spread! Love the activity you did after reading the book! Thanks for sharing! Love the ideas you did with this book! I absolutely LOVE David Shannon! We do monthly lice checks at our school and after every school holiday. This book would be great for helping the Kinders get used to the idea of having their heads checked! I need this book! We had a big lice problem last year and I don't want to repeat that ever again! This book looks like so much fun!! I love David Shannon's books, as do my littles! That looks like a great book! Thanks for the opportunity! Love this lesson! Hope I win! Neat book. 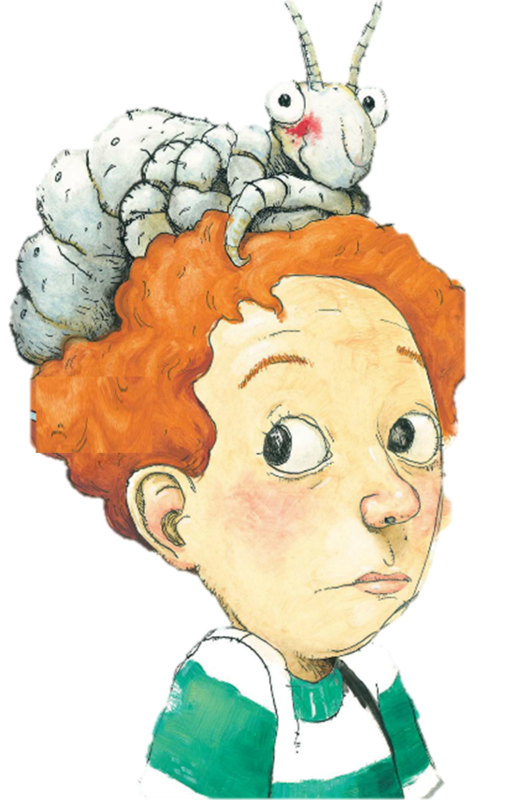 I never thought about specifically teaching about head lice. Kids need to know. I can't wait to read this book. I love David Shannon! Did you know that he hides a picture of his dog Fergus in all of his books? I would love to enter your giveaway and win these books. I don't have any of them and would love them. I love David Shannon!! This would be so great to use in my classroom!! AWESOME IDEA!!! Especially the glitter! I am feeling so overwhelmed this year with 23, YES, 23 Kindergarteners. I am going into my 4th year of teaching, and just my 2nd year of teaching K. I follow your blog DAILY and I think you are fabulous! ANY ADVICE???? Oh my! I'd really, really like to win this book for my school library! Now I have read it all. This book is a classic in the making. This is a must have. :) Crossing fingers and waiting. I love David Shannon's books. Thanks for the opportunity. I love this idea for my kindergarten classroom! "No David" and "David goes to school" are among my students favorite books every year. My big book version of "No David" is in tatters but I keep taping it together as my kids love it so much..
His new book Bugs in the Hair sounds fantastic and it will get added to my book collection one way or another. I have certainly dealt with the lice problem so this book looks like a must for my shelves. I love your blog April- you have great book sense and I have found lots of books through your blog that I was not yet familiar. I may not be eligible to participate in your giveaway as I am a lady from Alberta Canada but I wanted to leave a comment. This book looks adorable! What a great way to teach germ spreading! David Shannon writes great books for kids! Would love to read Bugs in my Hair!! Looks like a fun book to teach about germs!! I love David Shannon!! I can't wait to read David Shannon's new book! I'm starting my school year off by reading David Goes to School. What a great way to teach about germs, love David Shannon! My students have always loved your books, David Shannon! I am looking forward to buying "Jangles" for a sweet boy who loves to fish and "Bugs in my Hair" (that is if I don't win it. 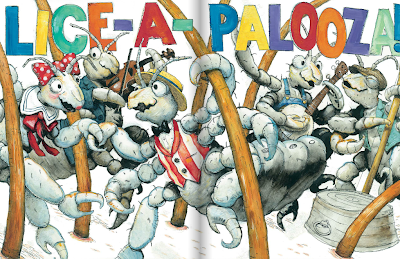 I think the Bugs book will help my Kindergarten students understand about having head lice... that they are not alone... and that they can laugh about it.... Thank you for sharing such wonderful books! I love all of David Shannon's books. This one looks really good. I would love to win this!! David Shannon is one of my favorite authors!! My children always, always love his books!! My favorite book is , A Bad Case of Stripes!! Yuck, but oh, so necessary!! David Shannon is one of my favorite authors! This book looks adorable! Oh gosh, it seems like everyone in my class is sick already (including me!). And I don't think I've had a year go by yet in which a student didn't have lice! So we could definitely use this book! My students love his books! This would be a great addition to our library! I love David Shannon books and so do my students! Those would be a great addition to our class library! Would love to win some free books. My class and I love David Shannon! The glitter germ activity is genius! Would love to try this lesson. David Shannon is always a fav with my students. Can't wait to read this one! We always start the year with No David! and David Goes to School. I would love to add Bugs in my Hair to my collection. Love Chalk Talk and all of your ideas, April. I LOVE David Shannon and MUST add this book to my collection. We read, David Goes to School during our first week and make "Davids" to decorate our bulletin board. The kids just really relate to his books and think they are hilarious! Cute book and the craftivity is absolutely adorable! I love David Shannon. This looks like a great book to use with Kindergartners. The germs that your kiddos made were super cute! I can't wait to get this book, our book fair starts Tuesday! I'm totally going to do this lesson with my kinders. we've had a bit of a lice problem. Thanks for the post. I love David Shannon! I can't wait to get my hands on his new book. I hope I win!!! Looks like a great book. Definitely going to try the glitter lesson with my munchkins. This would be great to win! Thanks so much! We just dealt with this at my school. How great to have a humorous book about the subject. I love David Shannon's books and so do my students! My son, David, loved for me to read "No, David!" to him! Thank you for sharing your ideas . . . I totally plan on using the glitter activity! I love Mr. Shannon's books! I am so glad I saw this on pinterest! I am going to read this for sure! The glitter activity is going down in my room very soon! I am somewhat of a germaphobe, so this activity will help me prove a point! This book is hilarious! 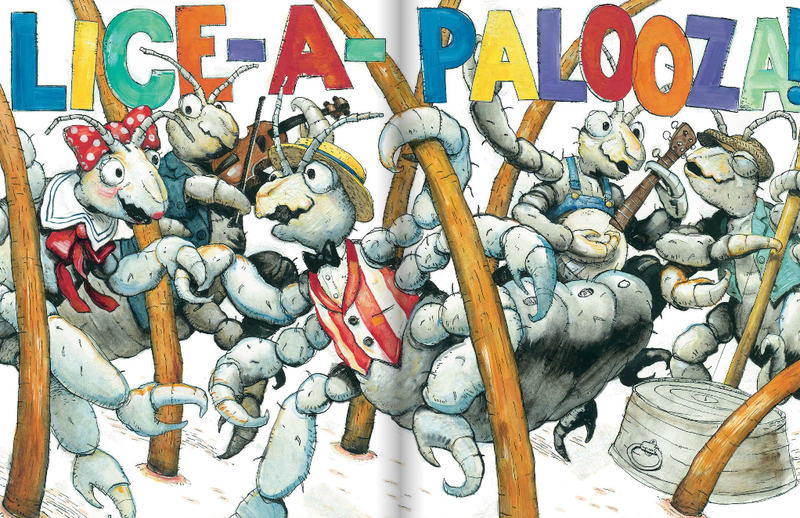 Only David Shannon could write a book about lice that kids and teachers would love. I own the book, and have used it in with my first graders! I have a case of it right now in my classroom! Eeeeek! I am so happy that someone is addressing this little issue in a fun way that kids can relate to. I think that it would be a great read for us, the teachers too.